Basecoating has been finished today on the main buildings of this painting and the fun begins next! It's so much fun to decide what each of these buildings will become. 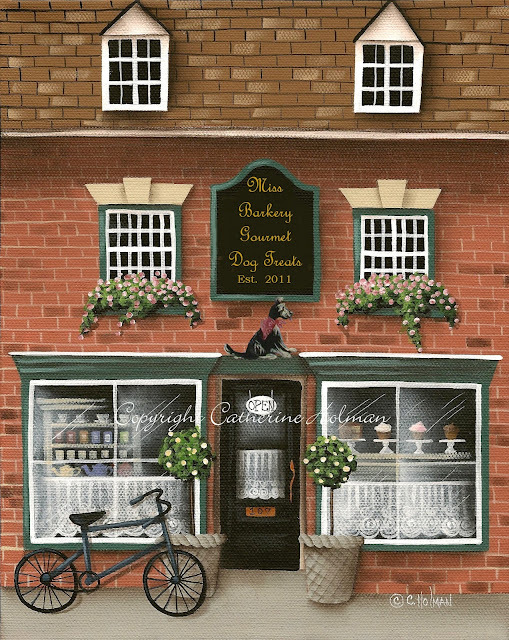 This past week a customer asked me to personalize my tea shoppe print for her and change it to a gourmet dog treat shop. The results are below. This has given me a great idea for one of my shops in this new painting. Keep watching and see what developes. I'm always open to suggestions too, so feel free to leave me a comment. Thanks Deb. I may be listing it soon for those who are interested or something similar. I will keep watching! How Fun! Your progress is encouraging. Looking good. Are the cupcakes going to feature bones on top? ☺ It says it is a Barkery, though it still looks a lot like a tea shop. Oh this is where I start paying close attention to what you're up to. I love the details and the stories. That's a great idea Vee. Our "Three Dog Bakery" in KC does look like a fancy bakery. They offer dog treats that look like real cakes, cookies, and cupcakes. I love this painting, but them I love all your paintings. Lovely work Catherine. It makes me smile.